This is an old version, see the latest version on the documentation wiki. I needed to test the SPI library with the newterm branch. I had a nice display from a dead Siemens phone. It uses a KS0074 display (which is an sort of SPI version of the good old HD44780). I found the datasheet and some example code on the internet (sorry only German is available). During the testing I found out the Bus Pirate spits out the bits the other way around then in the code/datasheet. Demo: is a weekly series that demonstrates devices with the Bus Pirate. Come back next Monday for another new demo. 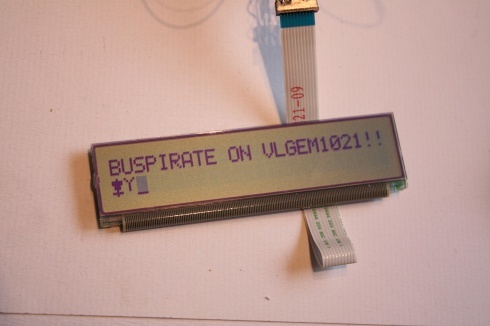 The display is powered with the Bus Pirate’s on-board 5volt power supply. The screen is 5volts and needs signal levels to be 5volts too. The Bus Pirate pin output is only 3.3volts, but the on-board pull-up resistors can be used for mixed voltage interfacing. From the mode menu (m) configure the Bus Pirate for SPI, any speed, and default clock polarity, edge, and sample phase. Choose open drain output type. Enable the pull-up resistors (P), and the voltage regulators (W). Be sure the Vpullup pin that feeds the pull-up resistors is connected to the 5volt supply. Display init and clear screen. Switch to normal input from command mode. 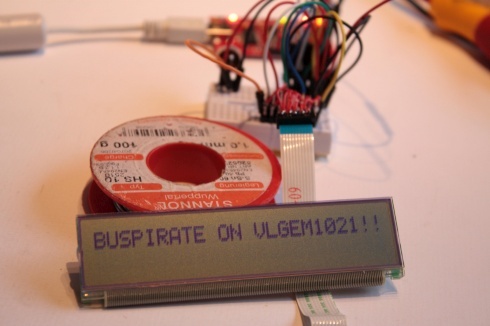 Write text to the first line “BUSPIRATE ON VLGEM1021!!”. Take CS low to finish the command. Set the custom character cursor to CHRAM position 0x00. Program a diode to chram pos 0x00. Program an antenna to chram at 0x01 (no need to set address again). Move to the second line. Display the custom character on line 2. Check the Bus Pirate manual for a complete list of chip demonstrations. Requests are always appreciated. This entry was posted on Monday, February 8th, 2010 at 8:00 am	and is filed under Bus Pirate, demonstrations. You can follow any responses to this entry through the RSS 2.0 feed. You can skip to the end and leave a response. Pinging is currently not allowed. Where to buy such an lcd ? These can’t be bought AFAIK.. They are from a Siemens digital phone (Optipoint 500 series) I had a couple of broken phones with working display, these I did use. Perhaps if you search ebay you can find a couple of phones. Interesting. I have a bunch of serial displays from old time clocks. Have to see what I can do. Which manufacture produce this display? Maybe any distributor sell this display.